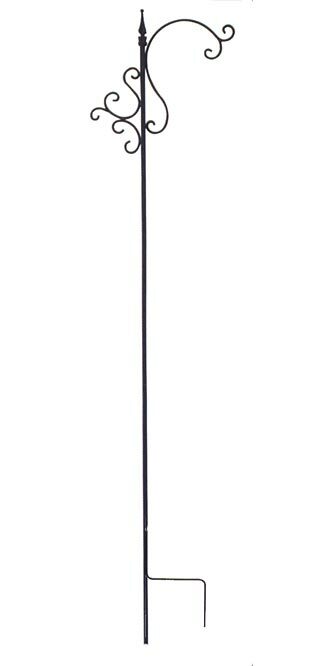 Create a stunning bird sanctuary in your yard with the Panacea Shepherd Hook with Teardrop Finial. One side of the main shaft features small upward and downward scrolls which add movement and drama to the piece. The other side has a large hook, perfect for holding spinners, bird feeders, or flower baskets up to 19" in diameter. A diamond shaped finial completes the look for a stately accent. The hook has a convenient "step-in" base, anchoring the item 10" into the ground. The square bar steel construction creates a sturdy unit, and the powder coated finish will protect it from the elements. The black color blends with your surroundings for a natural feel. Add a bold look to your backyard with the Shepherd Hook with Teardrop Finial.